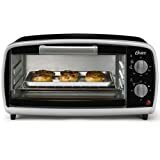 This is a great toaster oven for the price conscious consumer. Actually, the Hamilton Beach 31126 Easy Reach Convection Oven is one of the best toaster ovens that cost under $100. It heats up fast, has a convenient roll-top door and doesn’t take up a lot of room on the counter. This toaster oven is great for busy families. You can quickly toast waffles in the morning, reheat leftovers or bake some chicken nuggets for the kids at night. The best feature of this toaster oven is being able to cook small quantities of food. Toaster oven saves electricity; so it’s good for the environment and you aren’t heating up your entire kitchen. You would especially appreciate having a countertop oven during the summer, when you want to keep your kitchen cool. You can make up to six slices of toast at a time, this is a big difference compared to the traditional toaster. This toaster oven heats up quickly, and you can have a meal on the table very fast. 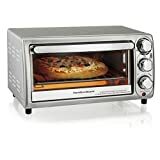 Hamilton Beach 31126 Easy Reach Convection Oven is a great little appliance that will help you cook quick and easy meals. You can bake a frozen pizza for the kids or roast a piece of salmon big enough to feed a couple of people. The toaster oven heats up much faster than a regular oven; great feature when you are pressed for time. This item is called Easy Reach because it comes with a roll-top door. The door can be opened above the oven so you can easily reach your food while preparing and grabbing your food when it is ready. Because the door opens above the oven, it also frees up your countertop space in front. Another benefit of the roll-top door is that the door and the crumb tray are both removable for cleaning so it is easy to keep the oven clean. The convection fan circulates hot air evenly for a uniform temperature ensuring even browning and even cooking. This method helps prevent raw or overcooked spots as your food cooks faster. You can reduce the cooking time by as much as 30%. Learn more about how a convection oven works. Hamilton Beach Toaster Oven has an automatic auto shut off feature; it’ll turn off after 30 minutes with ready bell. You can also select an optional stay-on setting. So no more wondering if you left your oven on. 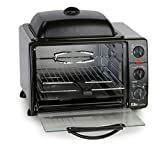 This toaster oven is great for someone living alone who need to cook a small cut of meat or fish or roast a few veggies. 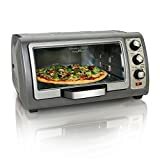 If you have a small kitchen or just don’t have a lot of room on the counter, you would appreciate the small footprint of this toaster oven. It is easy to use and to clean, perfect for busy singles and busy moms on the go. If you have an RV, and want to have the convenience of the oven but don’t have much room, this is a perfect-sized appliance. The low price also makes it a perfect choice for a cabin or a beach house. The 31126 Easy Reach has a 6 slice toast capacity and four cooking settings. 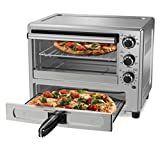 It can crisp up food, bake, reheat, broil and toast, everything you would get from a regular oven but in a much smaller package and at a much more affordable price. This toaster oven can get very hot on the outside so be careful not to touch the metal parts and only use the door handle. Don’t place it too close to the walls or other things on your kitchen counter. Related: What Can You Cook in a Toaster Oven? You are trying to get your kids off to school in the morning but everybody wants something different for breakfast. You son wants waffles, but your daughter wants pancakes. Does this sound familiar? A good toaster oven will make your busy morning routine so much easier. Grab frozen waffles or pancakes out of the freezer and throw them on the toaster oven tray; in just a couple of minutes the breakfast is ready! It’s hard to say who wouldn’t enjoy this toaster oven. It is great for families for fast and easy meal prep. If you are cooking for one or two people, this toaster oven has enough room to bake a nice piece of fish or roast a couple of potatoes. 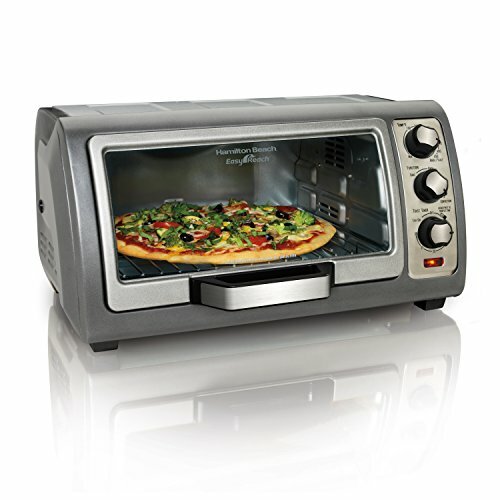 To sum up, this is a great addition to your kitchen if you don’t want to spend a lot of money on a countertop oven. Like every other kitchen appliance, it has its pluses and minuses; the biggest minus is how hot it gets while it’s on.